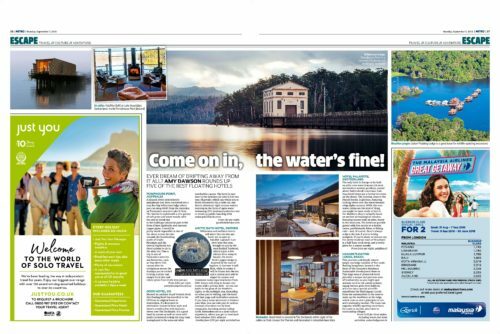 A DISUSED 1940s hydroelectric pumphouse has been converted into a cosy but hip wilderness lodge where you can sleep 800ft from the shoreline on Tasmania’s massive Lake St Clair. The interior is styled with a chic palette of soft greys and warm woods, with the odd on-trend nod to the building’s industrial past in the form of bare lightbulbs and exposed copper pipes. WILDERNESS and wellness lovers will adore this circular spa hotel, set to open on Swedish Lapland’s Lule river later this year. Brought to you by the team behind Treehotel, which is just a five-minute drive away in Harads, the Arctic Bath’s jagged design is inspired by the look of logjams. In summer it will float, while in winter it will be frozen into the ice, and a central pool will be ringed by saunas and treatment rooms (spa treatments from £80). THE only hotel in Europe to be built on stilts over water features 24 sleek and modern wooden pavilions, poised above Switzerland’s enormous Lake Neuchâtel (there are a further 14 rooms on the shore). The location, close to the French border, is glorious, featuring striking views over the water towards crisp Alpine scenery. THIS peaceful and deeply remote jungle eco-lodge consists of five rustic floating bungalows, located in the heart of the Amazon’s Mamirauá Sustainable Development Reserve. This huge area of protected forest provides a unique and precious area of biodiversity, so you might spot animals such as the uakari monkey, zigzag herons, pink river dolphins and even (on a special scientific expedition) the black jaguar.